Our warm, friendly general dentistry provides patients in and around Oklahoma City with exceptional dental care. Whether you're simply coming in for a dental checkup or you need more advanced cosmetic or restorative dental care, you'll find that Dr. Brad Mitchell and his team are always happy to welcome you. And with our comprehensive selection of dentistry services, we're confident we can meet your unique dental needs. Before going into dentistry, Dr. Mitchell completed his undergraduate studies at Oklahoma State University in Stillwater. He then earned his dental degree from the University of Oklahoma. 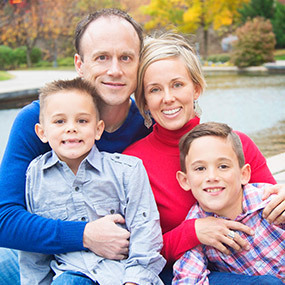 Dr. Mitchell believes being a dentist is "the best job in the world" because of the friendships he has developed, and because of the opportunity he has to improve the health and well-being of others. Through dentistry, he can literally change someone's life. Dr. Mitchell is a member of the American Dental Association, the Oklahoma Dental Association and the Academy of General Dentistry. Away from the office, he enjoys running, biking, and watching college football and the Oklahoma City Thunder. Together with his wife, they have two boys. He loves spending time with his family.